Introduction The number of specialist anaesthetists in most low-income and middle-income countries is below what is needed to provide a safe quality anaesthesia service. There are no estimates of the optimal number; therefore, we estimated the minimum density of specialist anaesthetists to achieve a reasonable standard of healthcare as indicated by the maternal mortality ratio (MMR). Methods Utilising existing country-level data of the number of physician anaesthesia providers (PAPs), MMR and Human Development Index (HDI), we developed best-fit curves to describe the relationship between MMR and PAPs, controlling for HDI. The aim was to use this relationship to estimate the number of PAPs associated with achieving the median MMR. Results We estimated that, in order to achieve a reasonable standard of healthcare, as indicated by the global median MMR, countries should aim to have at least four PAPs per 100 000 population. Existing data show that currently 80 countries have fewer than this number. Conclusion Four PAPs per 100 000 population is a modest target, but there is a need to increase training of doctors in many countries in order to train more specialist anaesthetists. It is important that this target is considered during the development of national workforce plans, even if a stepwise approach to workforce planning is chosen. The report of the Lancet Commission on Global Surgery recommended a minimum density of specialist surgeons, anaesthetists and obstetricians of 20 per 100 000 population. The report did not indicate the proportions for each specialty. We found that a minimum of four specialist anaesthetists per 100 000 population are required to achieve a reasonable standard of healthcare. Many countries currently do not achieve this number. Countries should aim for a minimum of four specialist anaesthetists per 100 000 population. To achieve this density, the output of medical schools must increase and entry to anaesthesia training be incentivised. It has been estimated that 5 billion out of 7 billion people globally do not have access to safe, affordable surgical and anaesthesia care when needed and that each year 143 million additional surgical procedures are required in low-income and middle-income countries (LMICs) to save lives and prevent disability.1 To begin to provide for this need, the Lancet Commission on Global Surgery (LCoGS) stated that a massive increase in the specialist surgical, anaesthetic and obstetric (SAO) workforce is required and recommended that all countries should have at least 20 SAO specialists per 100 000 population by 2030. The need for an adequate surgical workforce was underscored by the adoption, in May 2015, of World Health Assembly Resolution 68.15: ‘Strengthening emergency and essential surgical care and anaesthesia as a component of universal health coverage’.2 Furthermore, in support of universal health coverage (UHC), the Global Alliance for Surgery, Obstetrics, Trauma and Anaesthesia Care (G4 Alliance) has set a target of safe surgical care for 80% of the world by 2030.3 A key to achieving these targets lies in increasing workforce. Unfortunately, planning for the LCoGS’s 20 SAO specialists per 100 000 population is limited in practical applicability because the proportions of surgeons, anaesthetists and obstetricians—each of which are needed to provide quality surgical care—that should form this specialist SAO workforce were not considered.1 4 More granular information on these proportions is desperately required for benchmarking, advocacy and rational development of the workforce, if we are to achieve UHC by 2030. We aimed to use newly available country-level data on physician anaesthesia provider (PAP) density to estimate the minimum number of specialist anaesthetists per 100 000 population required to deliver a reasonable standard of healthcare. We used a similar methodology to that used by the LCoGS to estimate the minimum number of SAO providers. Data on PAP densities, MMR and HDI were not normally distributed, so variables are described using median and IQR. To explore the relationship between variables, we transformed the data to enable production of best-fit curves. We examined the relationship between PAP densities and MMR by visual inspection of graphs plotting MMR and PAPs both as continuous variables and with PAPs divided into quintiles. We also derived equations to describe the relationship between PAPs and MMR both without and with HDI as a confounding variable. We then explored the number of PAPs that were associated with the median MMR and describe the number of countries that are below, at, or above our estimated minimum number of PAPs. We were able to match PAP density, MMR, and HDI data for 168 countries (online supplementary file 1), representing 98% of the world’s population. We found that the median number of PAPs was 4.78 per 100 000 (IQR 0.85–12.70); the median MMR was 52.5 per 100 000 live births (IQR 12–221.75), and the median HDI was 0.73 (IQR 0.56–0.83). There was an inverse non-linear relationship between PAP density and MMR (figure 1). Visual inspection of the best-fit curve associating these variables suggests a steep decrease in MMR between 3 and 5 PAPs per 100 000. 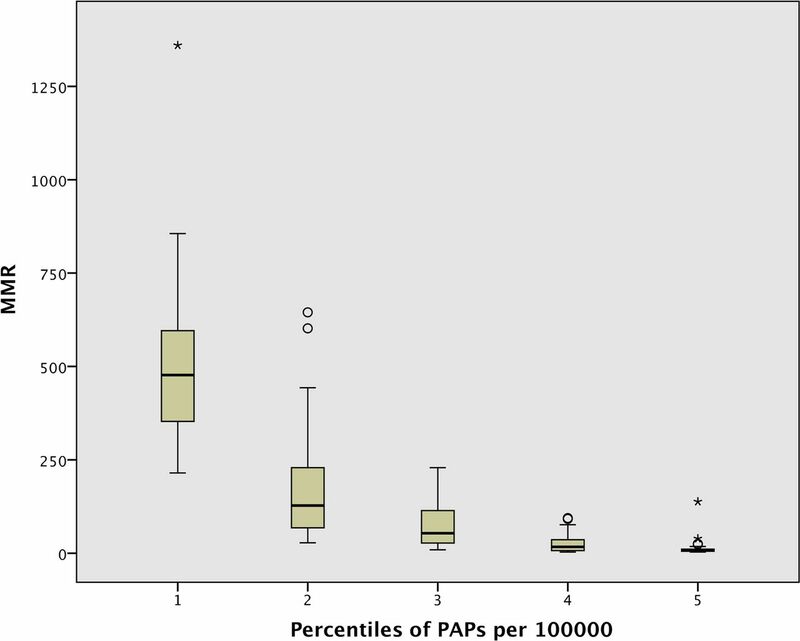 Analysis of PAP densities by quintile groups is shown in figure 2; visual inspection of this data suggests that a PAP density range of 2.45–6.76 (quintile 3) is associated with a steep decrease in MMR. The relationship between physician anaesthesia provider (PAP) density and maternal mortality ratio (MMR) for 168 countries, globally. Each circle represents data from one country. The solid horizontal line shows median MMR of 52.5 per 100 000 live births. 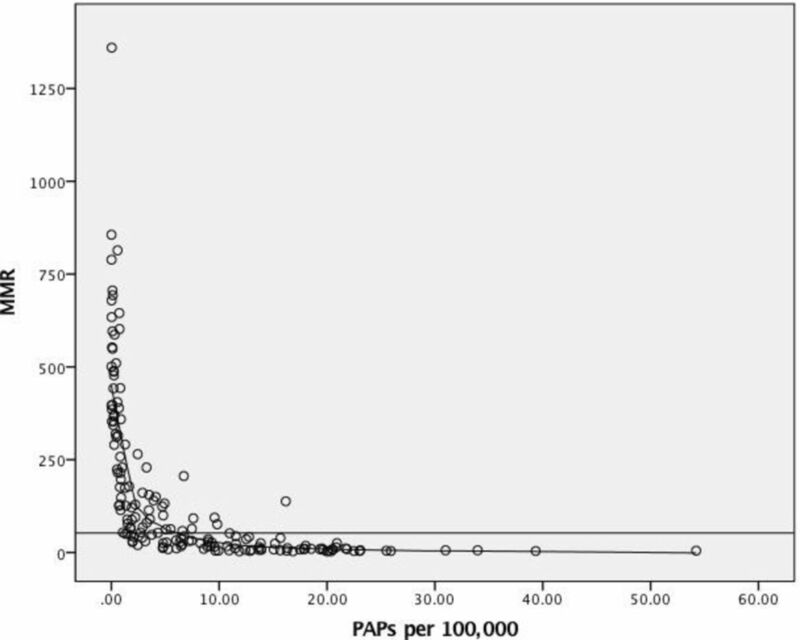 The relationship between physician anaesthesia provider (PAP) quintiles and maternal mortality ratio (MMR) for 198 countries (quintile 1 is 0.1–0.62 PAPs per 100 000; quintile 2: 0.7–2.44; quintile 3: 2.45–6.76; quintile 4: 7.18–15.06; quintile 5: 15.17–54.22). 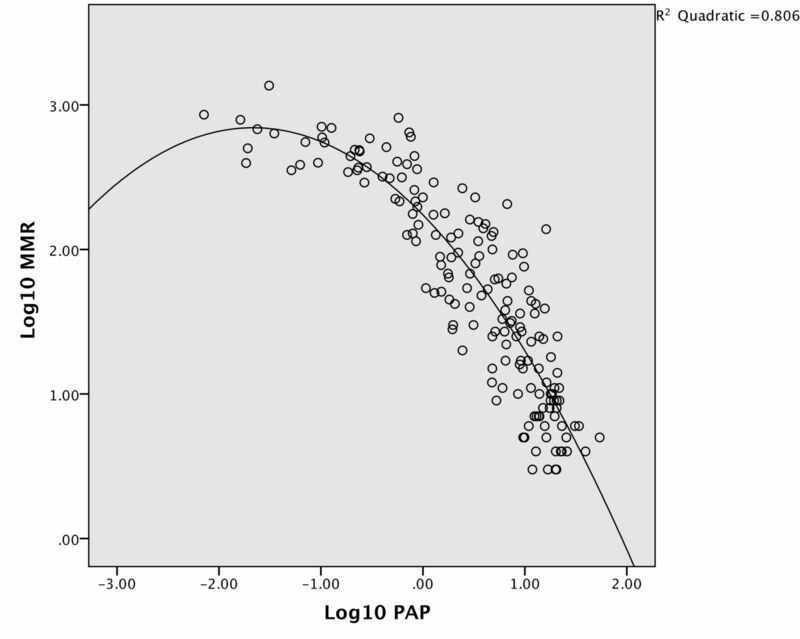 On further exploration of the relationship between PAP densities and MMR, we found that this was best described by using a quadratic equation of the log10 transformed variables: log10MMR=2.24−0.72(log10PAP)−0.22(log10PAP)2 . The correlation coefficient (R2) for this equation was 0.806 (figure 3). Log10MMR plotted against log10PAP. R2 for the quadratic equation is 0.806. MMR, maternal mortality ratio; PAP, physician anaesthesia provider. Analysis of the relationship between MMR and HDI revealed a clear association between the two variables. This relationship was best described by plotting the log10MMR against HDI (R2 =0.858) (see figure 1a and 1b in the online supplementary file 1). Because of the clear association between MMR and HDI, we performed a linear regression analysis (with forced entry) which included HDI. Even with HDI in the equation, log10PAP and log10PAP2 remained significant independent predictors of log10MMR; beta weightings and p values are presented in table 1. We solved this equation using the median HDI of 0.73 and found that a PAP density of 4.04 per 100 000 population is associated with the median MMR (52.5). By various methods, we estimate that approximately four PAPs are associated with the median MMR, which is our marker of a reasonably performing health system. On review of the global PAP density data, we found that 48% (80/168) countries had less than 4.0 PAPs per 100 000, 12% (21/168) countries had 4.0–7.0 PAPs per 100 000, and 40% (67/168) countries had more than 7.0 per 100 000. Using World Bank Income Categories, 100% of low-income countries had a PAP density of less than 4.0 per 100 000, compared with 77.1% of lower middle-income countries, 34.1% of upper middle-income countries and 2.2% of high-income countries. We estimate that a minimum number of four PAPs per 100 000 is required to achieve reasonable healthcare, as indicated by the median MMR (which is a similar MMR to that currently seen in Argentina or Mauritius). We chose the MMR to represent a reasonably functioning health system for several reasons. First, to remain in line with the LCoGS’s methodology; second, because the data are widely collected and readily available, and third, the MMR is frequently used as a measure of the state of countries’ health systems. Following the passage of Resolution 68.15 by the World Health Assembly in 2015, unanimously calling on member states to strengthen emergency and essential surgical care and anaesthesia as a component of universal health coverage,2 many countries are now developing National Surgical Anaesthesia and Obstetric Plans.9 An estimate of the minimum number of specialist anaesthetists per 100 000 population is essential for this process. As well as having face value based on our calculations, we argue that a density of 4 to ‘achieve’ a MMR of 52.5 is a modest target and should be strived for, given that MMR is around 10 in many high-income countries. There are limitations to our analysis. First, our estimates were initially based on visual inspection of graphs, which can be prone to error and bias. However, the LCoGS’s widely cited recommendation on workforce density was also based on visual inspection of a curve plotting the relationship between number of SAO providers and MMR; a specialist surgical workforce density of more than 20 per 100 000 was found to be associated with a steep increase in maternal survival, with the curve flattening out at provider densities above 40 per 100 000. While we used a similar approach to determine the minimum PAP density, we strengthened our finding by estimating the number of PAPs required to achieve a median MMR after mathematically describing the relationship between the two variables and including the effect of HDI. Second, our use of a median MMR could be considered to be arbitrary. We recognise that the median MMR is lower than the United Nations Sustainable Development Goals (SDG) target of less than 70 per 100 000 live births. However, our goal was not to see how many anaesthetists are needed to meet the SDG target, but rather how many are needed to form a reasonably functioning health system. We believe that the median MMR is an appropriate measure of this. Third, MMR is just one marker of a well-functioning health system—there are many other such markers. Nevertheless, we chose MMR because it is widely available, reasonably accurately reported, and it was the metric used in the calculations of SAO workforce used by the LCoGS. Our analysis shows that a minimum of four specialist anaesthetist physicians per 100 000 is associated with achieving a median MMR of 52.5. This is a modest target but will nevertheless be seen as highly aspirational in many LMICs. It is important that this target is considered during the development of national workforce plans, even if a stepwise approach to workforce planning is chosen. Every journey starts with a step, and this is a journey we must take if we are to provide safe anaesthesia and surgical care for our patients.
. 68th Meeting. “WHA 68.15. Strengthening emergency and essential surgical care and anaesthesia as a component of universal health coverage”. Geneva, Switzerland: World Health Organization, 2015.
, 2018. World anaesthesiology workforce. Available from: https://www.wfsahq.org/workforce-map [Accessed 26 April 2018]. , 2018. Agriculture & rural development. Available from: https://data.worldbank.org/indicator [Accessed 26 April 2018]. , 2018. Human development report. human development data (1990 to 2015). Available from: http://hdr.undp.org/en/data [Accessed 26 April 2018.].
. Anaesthesia as a career choice in a developing country; effect of clinical clerkship. J Pak Med Assoc 2011;61:1052–6.
. Career choices for anaesthesia: national surveys of graduates of 1974–2002 from UK medical schools, BJA: 2005;95:332–8.
. Impact of clinical officer anaesthetist training programme at the kenya medical training college, nakuru, on trainee satisfaction, quality of practice, and cadre shortfall alleviation. East Afr Med J 2013;90:226–34. , 2017. WFSA releases position statement on anaesthesiology and Universal Health Coverage (UHC). Available from: http://www.wfsahq.org/latest-news/latestnews/682-wfsa-releases-position-statement-on-anaesthesiology-and-universal-health-coverage-uhc [Accessed July 17 2017].
. WFSA describes its vision for implementation of WHA 68.15. The Bulletin of the American College of Surgeons 2018;103:44–8. Correction notice This article has been corrected since it published Online First. The second affiliation is corrected to Institute of Applied Health Research (it currently reads Allied Health Research and email address for the corresponding author is updated to j.davies.6@bham.ac.uk. Contributors EV conceived the idea. JD did the analysis. All authors equally contributed to writing the drafts. Bisola Onajin-Obembe compiled the reference list. Data sharing statement All data used in this analysis are freely available from the references cited in the text.